As with practically any other device, the Samsung Galaxy S3 has its fair share of complaints. Some have workarounds, some can be solved with mods or apps, and some seem to have no fix at all. One common issue on the GS3 is that the GPS won't seem to work at all, refuses to lock onto any satellites, or frequently loses the connection, making it pretty much useless. But there does seem to be a quick (and somewhat unthinkable) solution to this—tightening a few screws. You don't even have to take the battery out for this! Just pop off the back cover on your GS3 using a flat head screwdriver, spudger, or your fingernail. 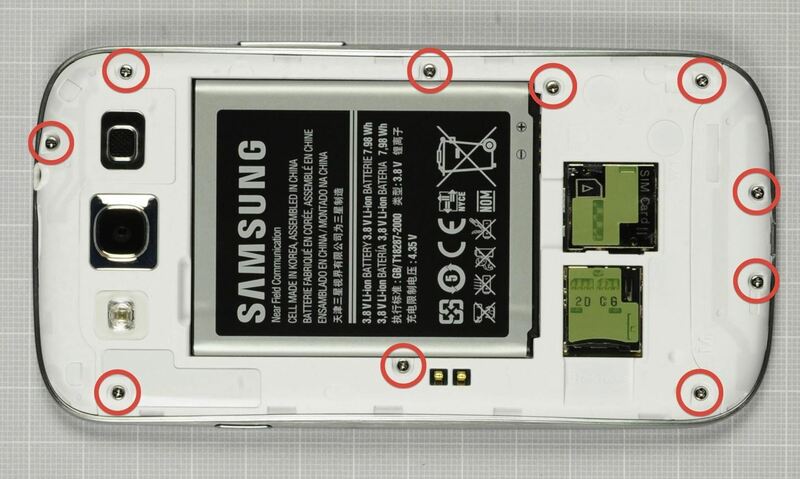 Around the phone's edges, there are 10 screws. Use a small Phillips screwdriver to tighten them as much as you can. Once you're finished, put the back cover back on and try out your GPS again. You should be able to get a lock on more satellites along with faster navigation and less signal dropping. If you start to notice issues again, just retighten the screws, just like you would for that wobbly dining room table that always needs retightened. It may be annoying, but it's free and a lot quicker than getting a new phone. And this should be your first DIY fix tried before resigning to installing new ROMs, flashing back to stock, trying aGPS patches, editing your gps.conf file, uninstalling/reinstalling Maps, etc. Did this trick work for you? Let us know in the comments below. Got wonky working Wi-Fi on your GS3? Try out this trick for getting a better signal. I tried just tightening the screws. None were loose and it did not help the GPS after I tried to tighten them. BUT... after I removed the back and lifted the top cover, I pried up the GPS antenna connector slightly. It is on the upper left corner (looking from the rear). This connector touches the inside of the upper back case. I also loosened and re-tightened the main board screw on the lower part of the phone in the center of the board (some say if this is loose the GPS will not function). After reassembling the phone the GPS is working well. Let's see if it is a permanent fix. Worked for me. 5 of the 10 screws were loose to some degree. Saw an increase in the number of satellites immediately. My s3 does not have that many screws does that mean it's fake.it's GT.19300.S3XXEMB5 unlocked unrooted running 4.1.2 ? You probably have one of these. Looks like it has nine screws. This did not work for me. I still have GPS issues. I've done everything else possible too. Clear AGPS, wipe phone, uninstall Google maps update, tighten screws etc. Talking to VZW support did not help either. Very frustrating! Apparently . . . . it's also valid for the Samsung S III mini . . . .
YAY thank you so much, that was stupid easy and it worked immediately! Incredible! Starting my new job as a courier, where I rely on GPS in 4 hours. I was panicking but it worked, on top of that, I have a Samsung Galaxy Note II, which I can verify it worked on! Amazing! At first, I thought it wouldn't work, but amazingly, it did! Thanks, this was good for my Mexican Telcel S3 Mini. It did not work for me. I have the model with the 9 screws and I still haven't any GPS on my galaxy III. Any other thoughts. Truly amazing, five minuts work and now even GPS indoor ! Thanks a lot. This is not the most obvious solution to the problem. It works, but does anyone know WHY it works? Worked for me as well. And for why.... I'm not sure, but I think the vibration mode causes the screws to come loose. Just a theory! Thanks again!!!! After trying almost everything - and I mean EVERYTHING on my Galaxy S4 - this simple workaround solved this super duper annoying issue. Happy, happy, joy, joy! It's the little things that make me soooo happy! This was awesome. Thanks so much! This totally worked on my SCH-I535 Verizon SIII. Google maps suddenly failed to find my location one day. I have tried every remedy short of new ROM with no luck. Tightened the screws (all of them were loose) and voila! I have GPS again! Many thanks for finding this fix and posting it! It worked for me for a few days only. I have turned on the GPS and still after more than 5 minutes it's still searching for satelites. I have a Samsung Galaxy III mini. Anyone with similar problems? I can't believe it. It works. How did you discover it? When I read this I remembered that I had dropped my phone pretty hard around the time this started and thought, "that would be too easy." But it worked! Thanks! I found the fix for a samsung s3 gps fix. Tightening the screws is a waste of time. All you have to do is go to google maps and clear the cache and clear storage. Your gps will find the location asap. I do this everytime I go to maps and it works great. Any other fix is useless. THE ANSWER TO TIGHTEN THE SCREWS IS A FAKE. DO NOT BELIEVE IT. AGAIN GO TO GOOGLE MAPS AND CLEAR CACHE AND CLEAR STORAGE. i DO THIS EVERY TIME i GO TO MAPS AND i ALWAYS GET MY LOCATION FIX ASAP. Don't void your warranty if you have a new phone. It may be a hardware gps issue. I had just gotten a replacement Note I I phone and GPS worked fine initially.Then it stopped moving from first screen although step by step list was still there. I uninstalled navigator, updated Google maps, still didn't work. Deleted cache and data in maps and location, still didn't work. Uninstalled update. Turns out it's a defective GPS hardware chip. Ran it in Safe mode and still didn't work. Tried it worth WiFi on.off, BT on / off still no improvement. Downloaded a program called GPS test and it appears to work with initial screen, but not when moving! Verizon Asurion sending out new phone. Was really hoping for a fix because of the hours/ days transferring data from one phone to the other. Sigh! Even tried Here App for Gps that Samsung is partnering with, but that couldn't find gps either, similar problems. I don't even know how to start thanking you. After spend countless of hours (rooting, different roms, different modems, soft bricking and the list goes on) this 3 minute fix solved everything like a charm. I fastened the screwes while the GPS Test app was running, and could see more satelites with every turn of every screw. It did work for my galaxy tab 3 sm-t211. Hope it lasts. I was so frustrated it could not hold a signal at alll. After the fix, the signal was instant and stronger then ever. Thanks Gabrielle. It worked!!! I can't believe it...!!! I've been this whole weekend trying to fix the crappy GPS (to play Pokemon Go) on my LG Magna (H502g), trying pretty much all the solutions posted everywhere, to no avail... The only reason I signed up on this page is to say: Thank you, Gabrielle!!! And greetings from Chile!! Apart from being a doll, you simply nailed it. But as soon as I get out it takes like 200 ms for it to grab it!! !